The efficacy of platelet transfusion in the management of ITP remains obscure. In patients with hematologic disorders undergoing myelosuppressive chemotherapy or hematopoietic stem cell transplantation, platelets are widely transfused prophylactically, and a platelet transfusion threshold of 10,000/μL has been recommended to be safe and effective. In ITP, however, prophylactic platelet transfusion is not recommended because the rise in platelet counts following platelet transfusion is not seen because of rapid destruction of transfused platelets. 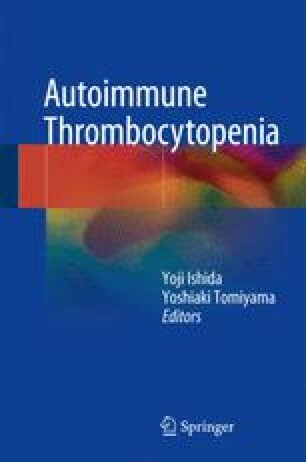 In ITP patients with severe active bleeding, anecdotal evidence suggests successful treatment of platelet transfusion alone or in combination with intravenous immunoglobulin. Platelet transfusion may be also considered before splenectomy in ITP patients. Recent studies suggest that laparoscopic splenectomy can be a safe and feasible procedure in ITP patients with platelet count less than 10 × 103/μL without platelet transfusion.